These are quick adds to the website we will upload more to the main categorie pages later ! The Most recent Recent Jobs are at top of page. 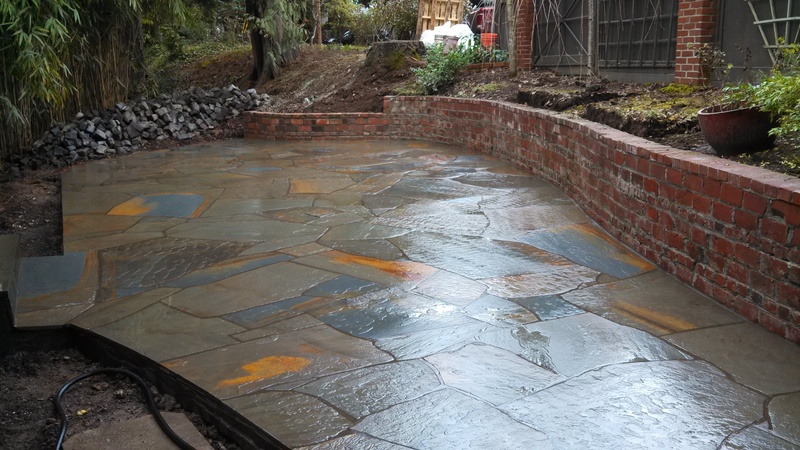 here we overlaid an existing concrete patio with a true blue outside boarder with variegated bluestone field area then added color to the mortar grout to tone down the mortar as it dried. 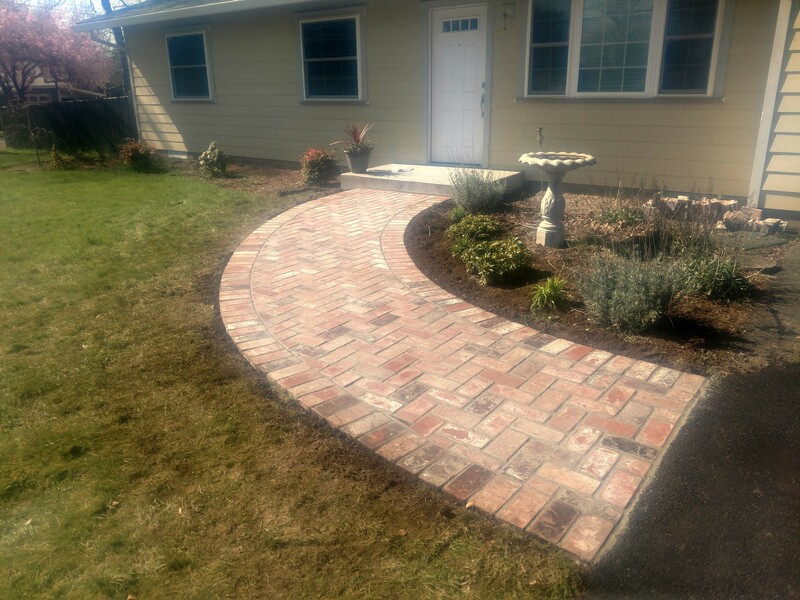 Here we installed Concrete and Brick trimmed driveway with Brick walkway entry , Brick from Mcnear brick company , came out very nice. 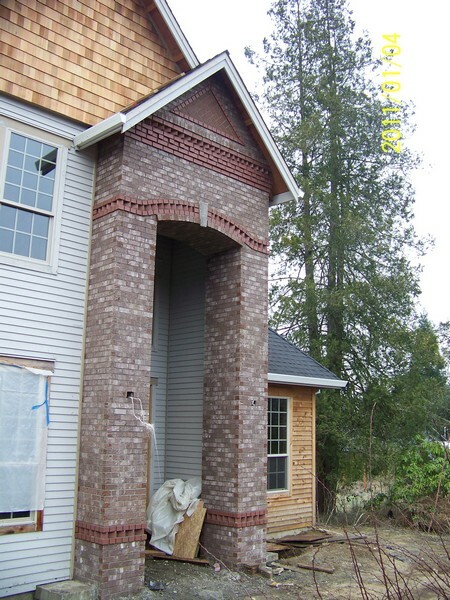 Ever wonder what your project could look like or what masonry can do to transform a older home or redesign a bad design into a new modern design using your old base?. Randy McKee masonry does it everyday. We design and build from the base to the final product , here are a few ideas of masonry of some recent jobs we have done if you see something that may look good in your home give us a call or use our contact form for same day contact. Here we installed the base like we do on almost every project we do , set up and poured and installed the brick . we then saw cut the joints for a more elegant look on a small patio that really helped it stand out. Here we have a clay pavers used on a patio and walkway . 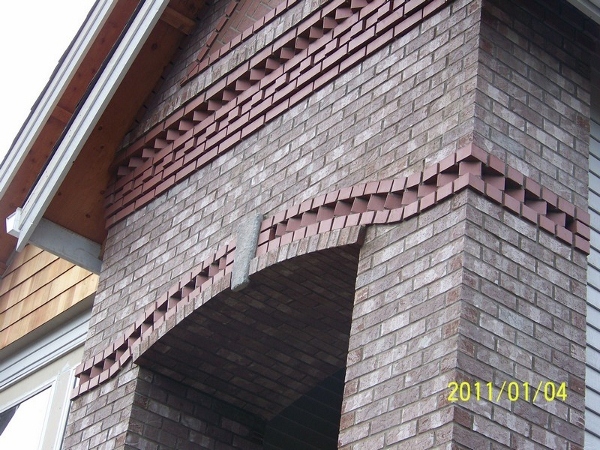 both from McNear brick company. very beautiful brick and clay lasts a lifetime. Here we installed the footing and then planter and wall with a block base . then veneered with a rox pro stone . 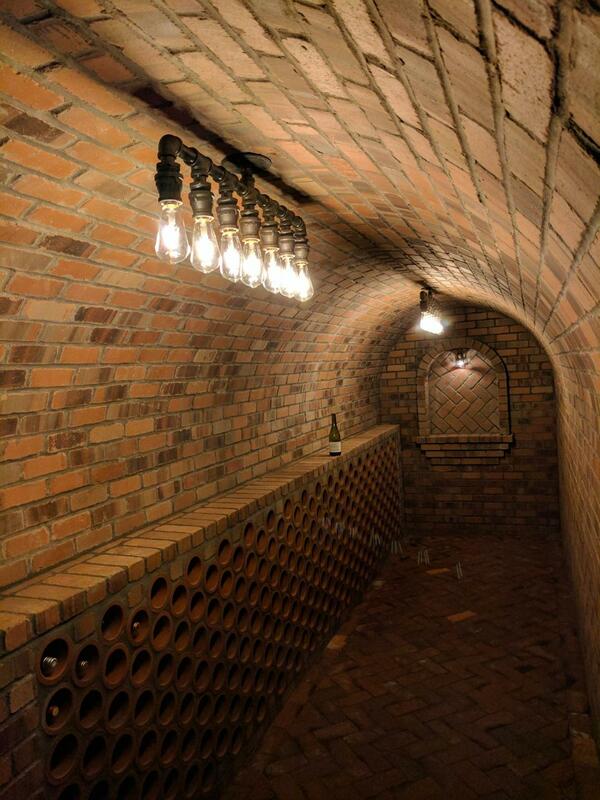 Here we installed a brick wine cellar in full brick. We will make that cellar come to life , the customer installed the light fixtures that really just fit this perfectly. We arched the doorway arch into the arch of the main wine cellar . the customer provided the the flues for the wine ,We will be going back to install another wall of wine flues on the opposite side to make it hold all most 500 bottles . that should last a day or two! HA! 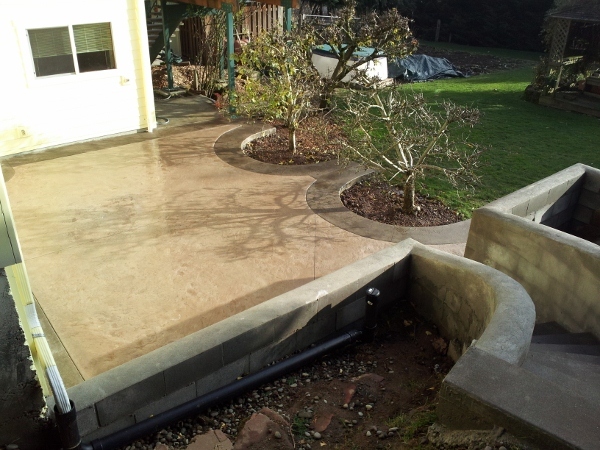 Here was the test patio we did with a new machine I invented to help stamp the concrete fast . we did this with 2 people doing the stamp and 16 stamps. 11.5 yards. and none hit it with a tamp ... not once. .. fastest tamper there is bar none. I am building them right now for rental . and later forsale. 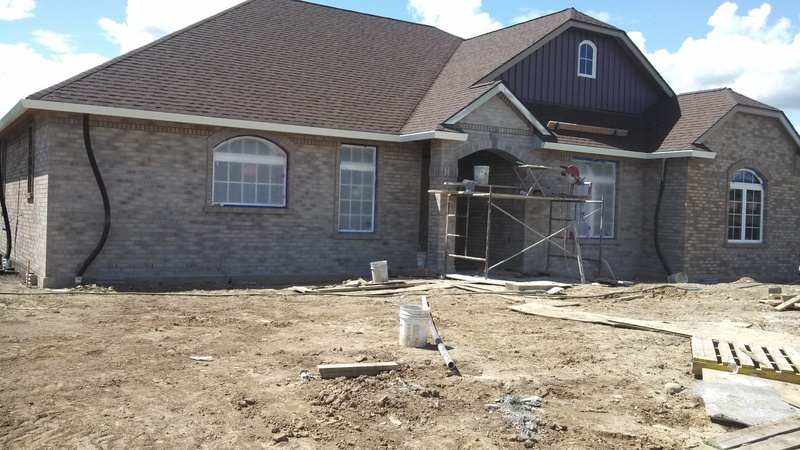 We do all the excavation , footings and masonry on all of our jobs. 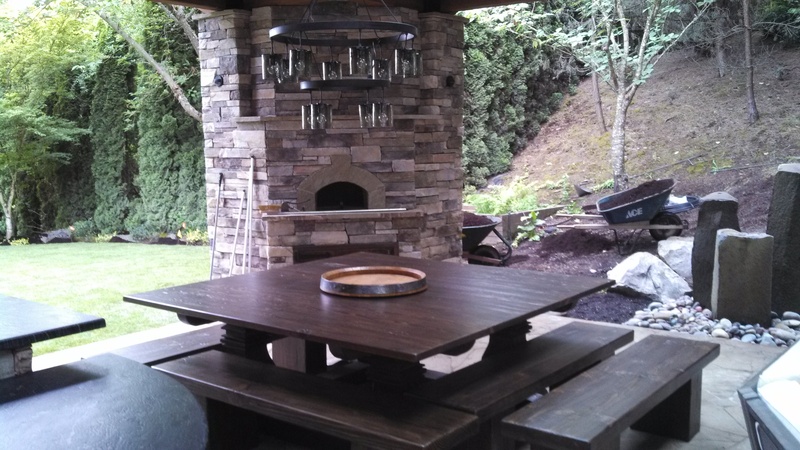 Here we installed a outdoor pizza oven and repaired the fireplace throat area that was built completely wrong. (USE A MASONRY COMPANY FOR FIREPLACES) the fireplace had a 8 inch square opening for the smoke to go through and no smoke chamber. It smoked with kindling. 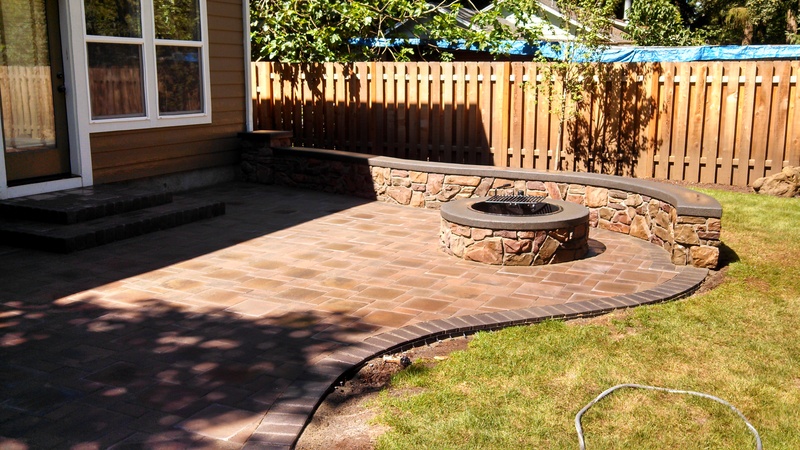 Here we Installed a new stone patio and also went over the old concrete patio with stone from Smith rock company. 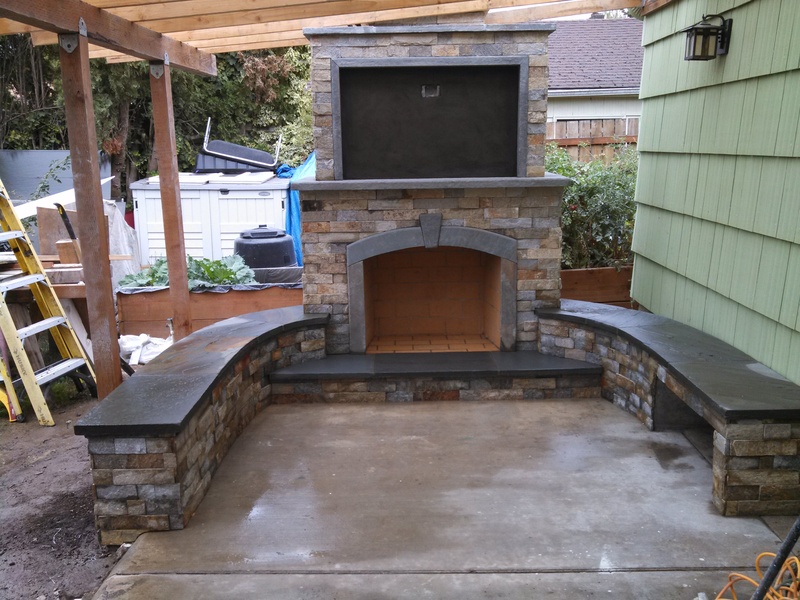 We installed the out door Fireplace with TV area , BBq and bar which included a EVO ( Mongolian Bbq grill ) . 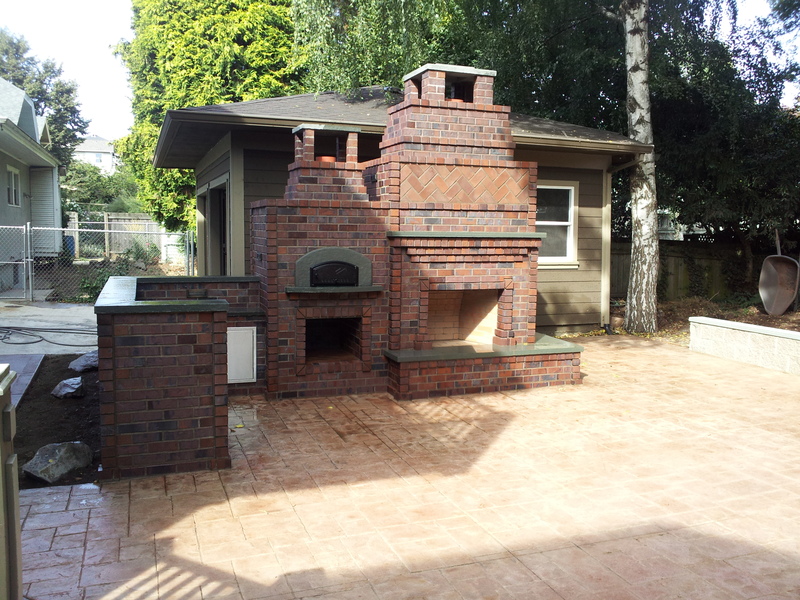 We Installed a Forno Bravo type Pizza oven and redesigned the oven and fireplace to fit into the structure correctly. 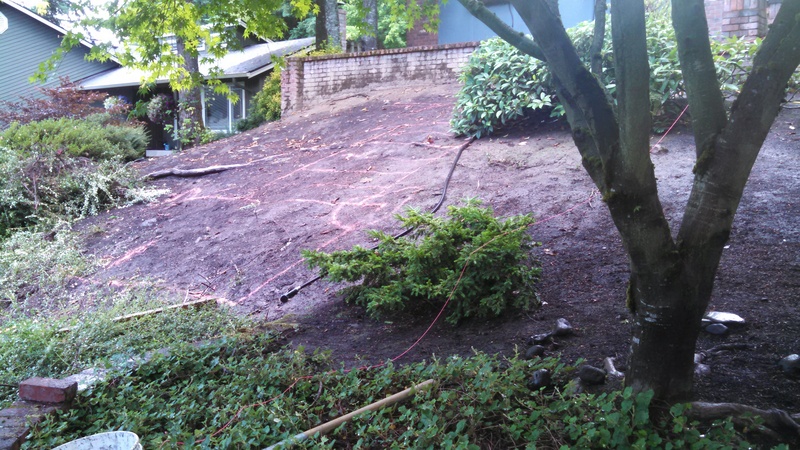 From the excavation to the install of footing and concrete exposed patio. we did it all. 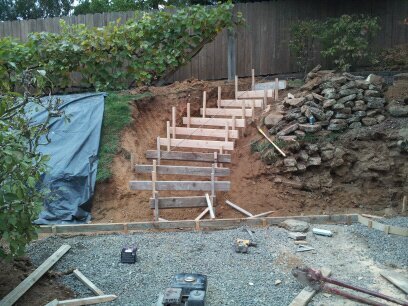 Here we hand dug the staircase and installed a good base. we then setup and poured the steps and exposed the concrete. 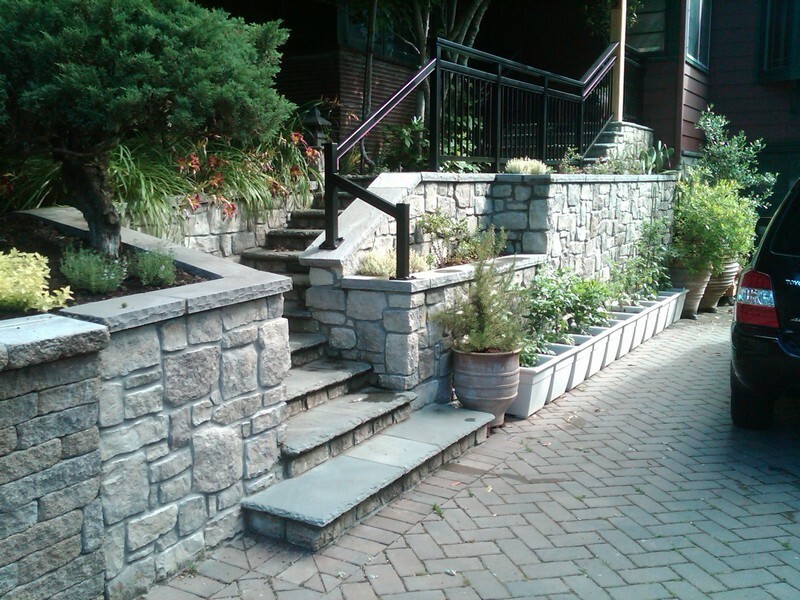 We installed brick on the risers and large boulders on the landing areas to give it a more natural look . we saw cut the lower wall at street and installed the columns with lighting on top. this is a very nice addition to the front of the home and provided access to the front door without monster steps and fit the landscape to. 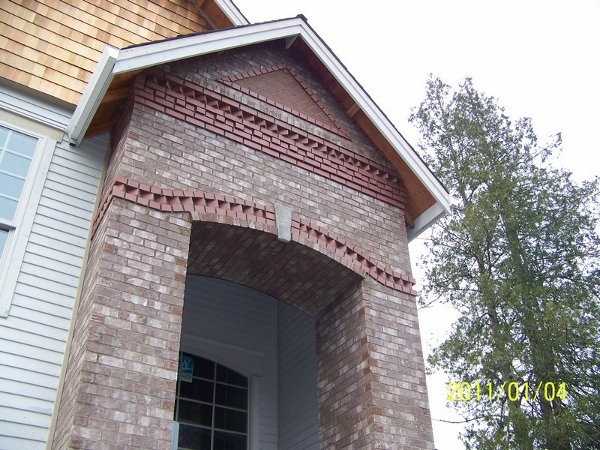 Here we Brick veneered this new home in carlton Oregon, Installing Brick arches over the front windows , garage doors and entry. 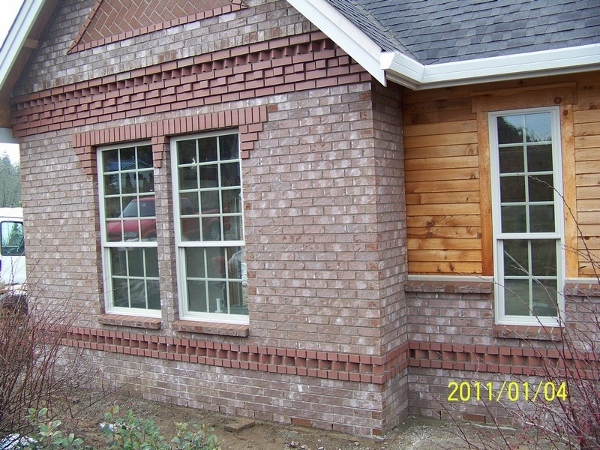 Click here for more Brick veneer pictures of this home. 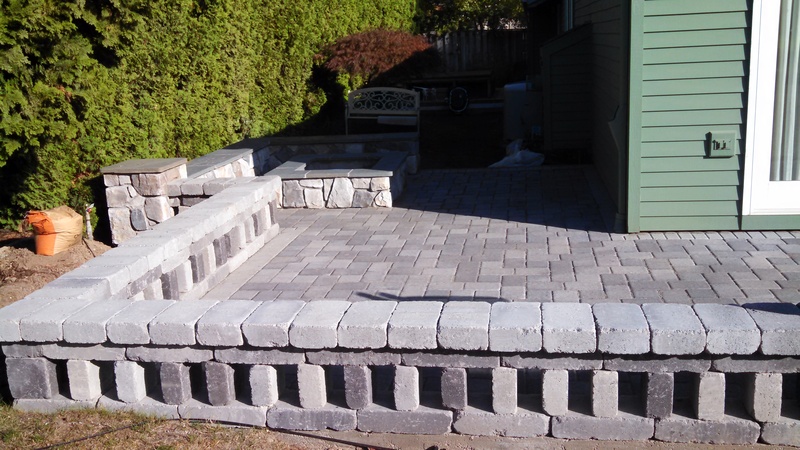 Here we installed a new sand set paver patio with seating and firepit. 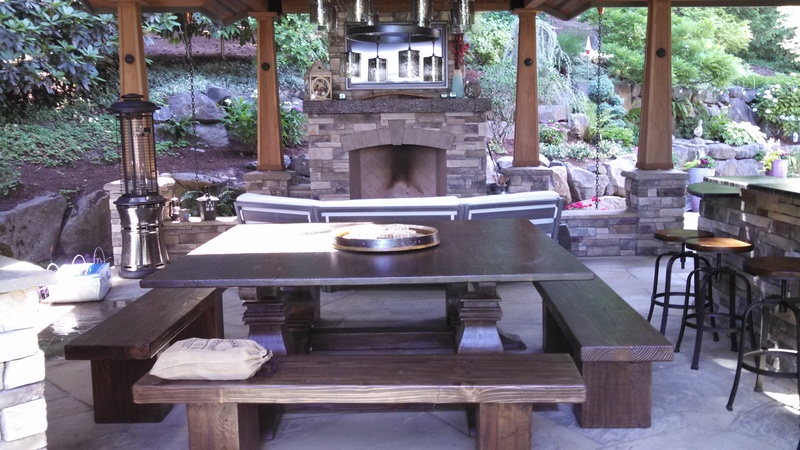 Give us a call and see how much we can save you on your patio ideas Or help you design one that fits into your landscape. callus at 503 554 9510 Anytime..Or send us web form for same day contact. Here we installed the footing and block retainer wall base that gives the planter strength where they need it with a block theme on the back and brick on the front to help keep costs down. We installed a picture framed herringbone design for a nice back ground and customer chosen peaked cap on top of the walls. 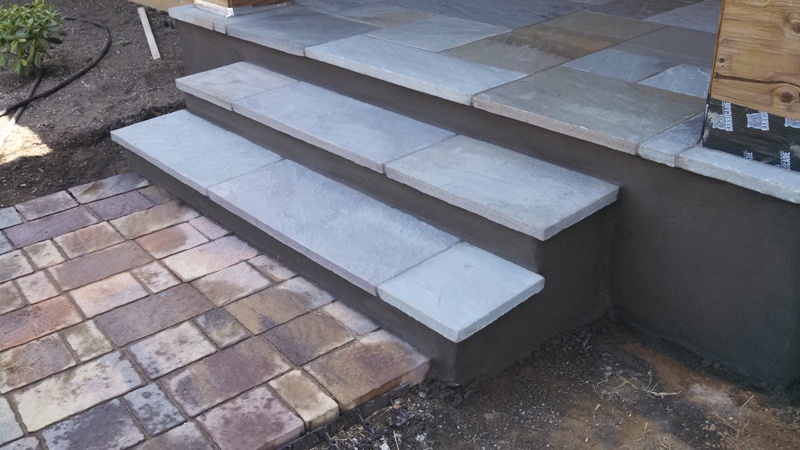 Have a tight area where you want to be able to get down from above to a lower part of your yard but don't have enough room for a straight staircase?..well we can fix those staircase problems in those tight areas. 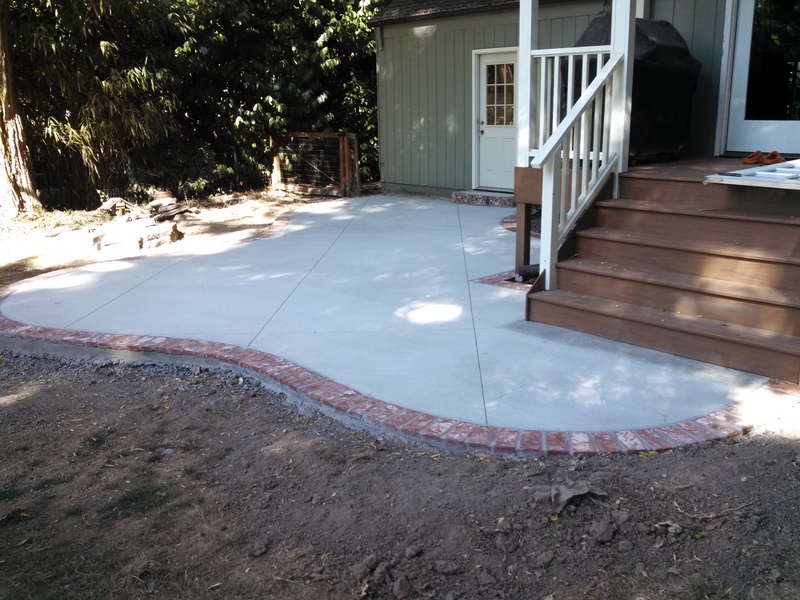 This Radius staircase allowed for a nice transition down to the new stamp concrete patio area. the staircase was only 8 feet to the far side , this even allowed for room to walk along the back side of the yard to work on the grape vines without stepping out into the staircase. The Retainer walls were built i block with the customer planing to rock the surface himself at a later date. This wall was poured solid with rebar through out to hold back the dirt. 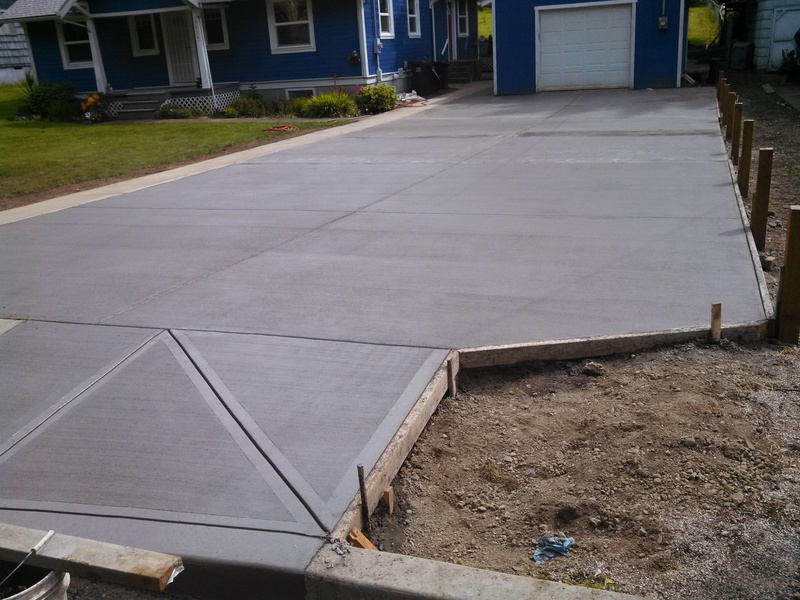 we poured the footing with the sand finish concrete parameter then poured the stamp concrete and water stained the surface, then finished it off with a acrylic sealer. 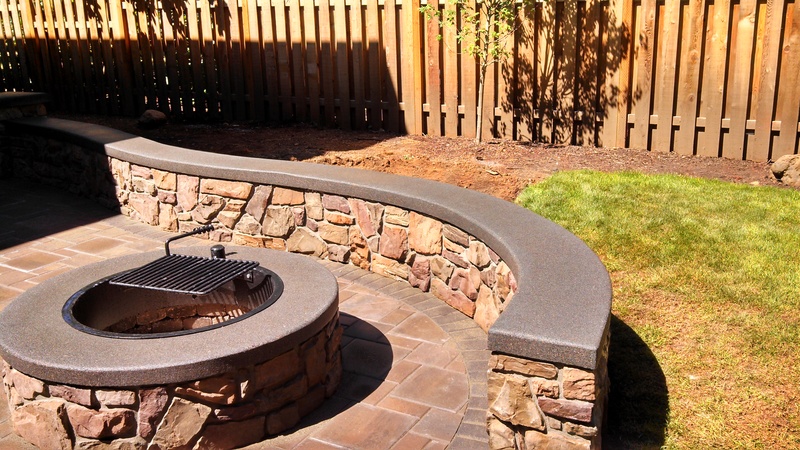 Masonry ideas for outdoor fireplaces and ovens , concrete stamp patios with waterstain ,brick entry,backyard patio's, complete brick veneer of your new home or remodel, we do it all. 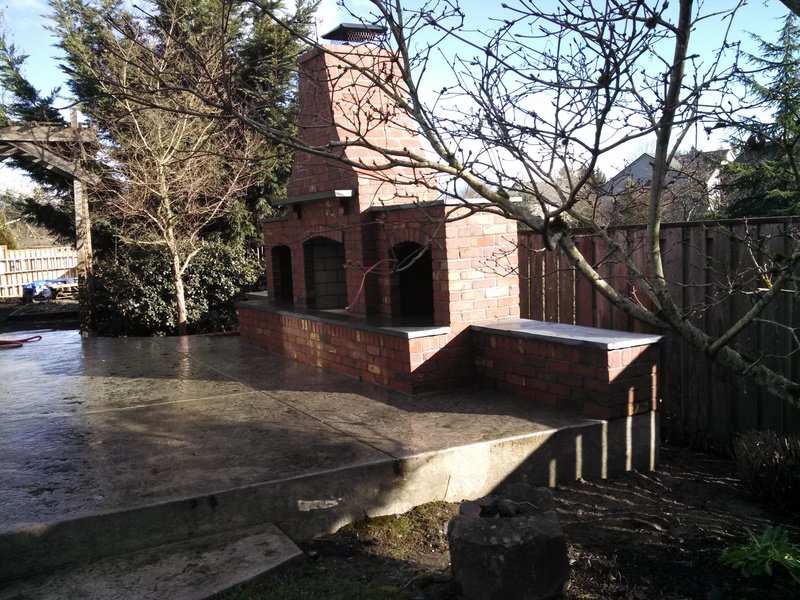 Here the customer had a basic fireplace and pizza oven design we had general idea to work from, we then designed it to make the pizza oven and the outdoor fireplace each stand out on there own even thought they are side by side. The fire box of the pizza oven was going to be a 36 inch round oven but felt the oven would be to small for a fire and the pizza. it would work but it would be very cramped, so we designed a oven that was rectangle and gradually rounded in until I was able to close the top . This will allow the best of both worlds , one of heating it and the other with the added space of a barrel type oven laid sideways for extra space. the oven will heat like a round oven and the new 1850 degree ceramic blankets will hold the heat in along with the 2 inch thick thermal floor with firebrick on top. We installed the cast iron door to give it the ideal look with a true bluestone surrounding the opening we ground round the edge and then thermed the edging. We also therm edged 2 inch true blue stone for the mantels and seating . 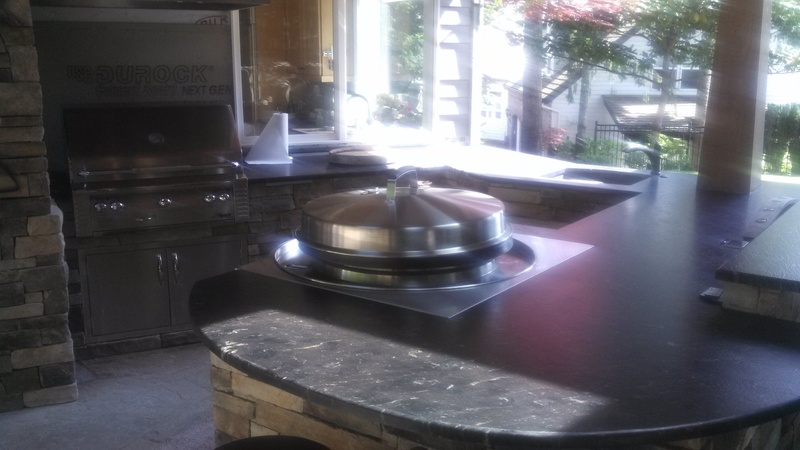 We finished off the counter door with a BBQ guys stainless steel door. 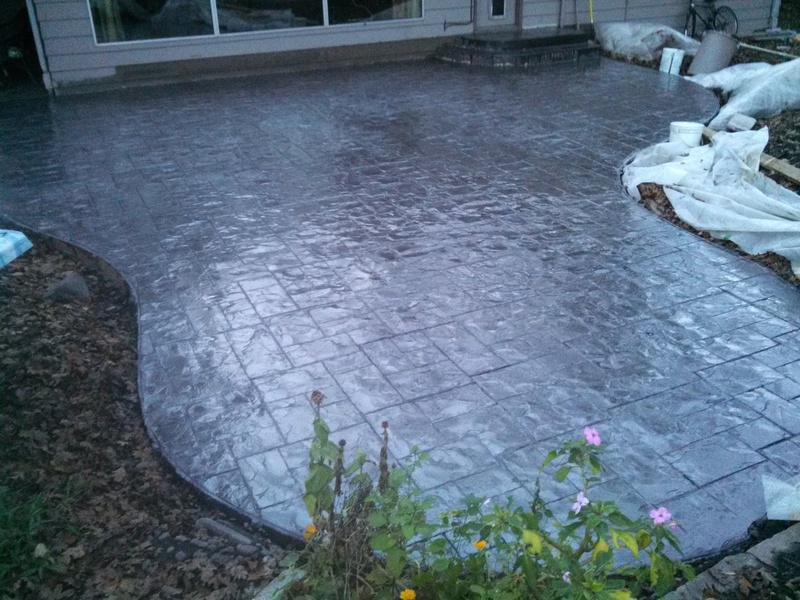 We then stained the ashlar stamp we installed with a water stain from proline and sealed the slab and walkways. We did the mock up to show how it would look before we did the new masonry ,once the owner accepted the design we removed the old stone patio area and installed a concrete base , we used the existing concrete entry ,which was way out of square with the home, we straightened every thing out with the new masonry . give us a call or submit our web form to see what we can do for you. We brick veneered this home with some unique ideas. The home had originally been designed for wood siding with wood blocks installed at the second floor levels. We removed the wood blocks and designed the masonry to project out far enough to allow for airspace and still support the upper masonry. We incorporated Combinations of saw tooth and headers and dental block design that really came out nice with a triangle of projected headers and herring bone design in the center on the upper gable areas. 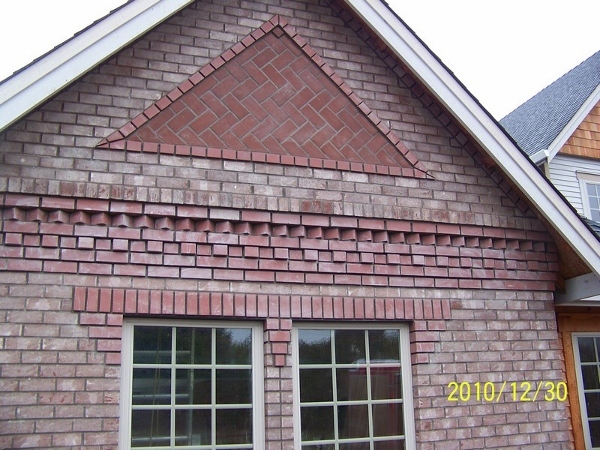 Randy McKee masonry has been doing brick veneers for over 24 years, we design and build from concrete foundations for walls to the brick, stone, and concrete patios to the brick and stone veneers. 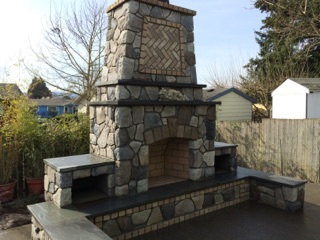 from you standard masonry to your personal unique custom design. 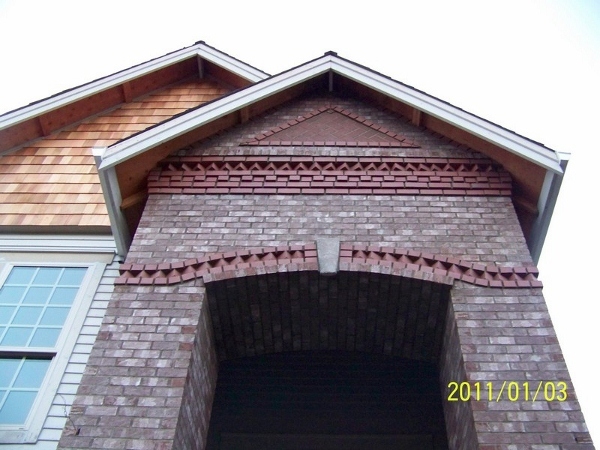 Oregon masonry at its finest! and are happy to provide the contact information of the customer. 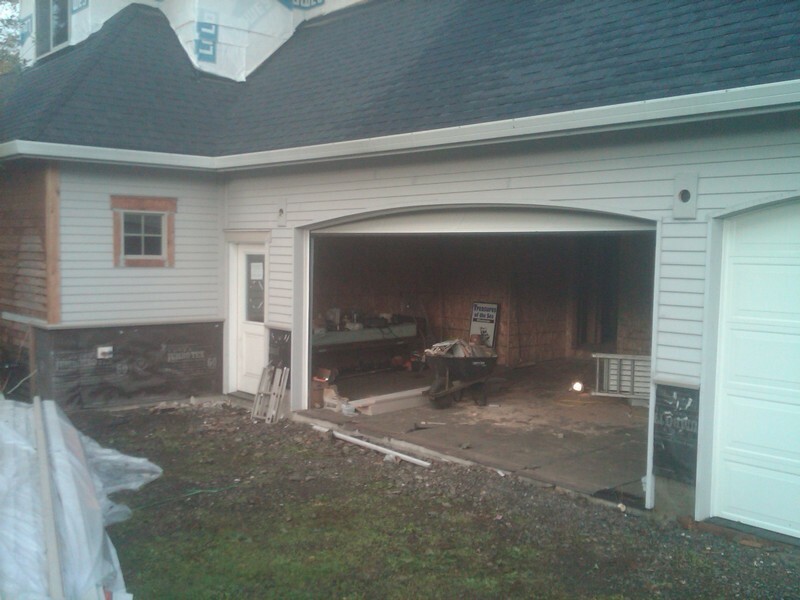 We saw cut the existing wall and removed the old patio. 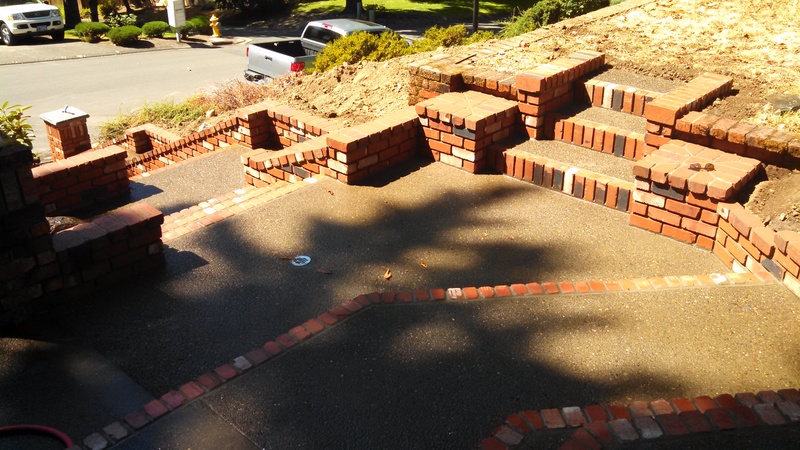 We then installed a rock base and re- poured the patio area and new staircase .We then installed the brick and upper block walls for the new water featured ,lower fire pit and seating area, with low lighting under the seat and in the walls and steps. 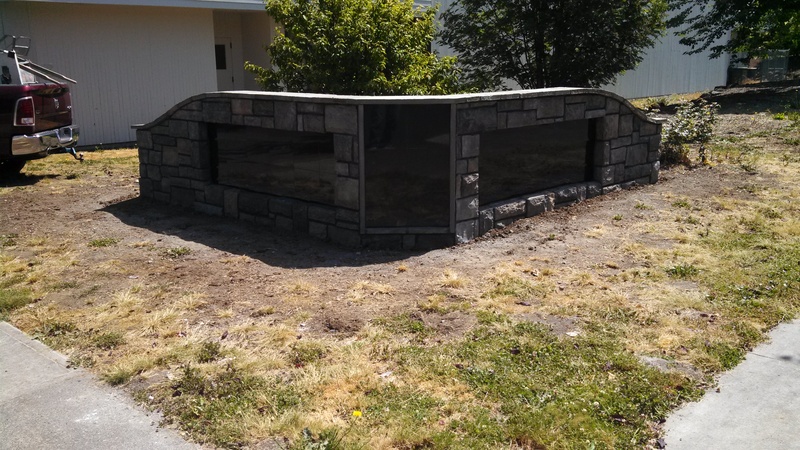 Here we cleaned up the old retainer wall and repaired a huge break in the wall, we then installed eldorado stone with chiseled edge cap stone on top of walls. we also redesigned the staircase and added a new wall that would hold a new iron railing. 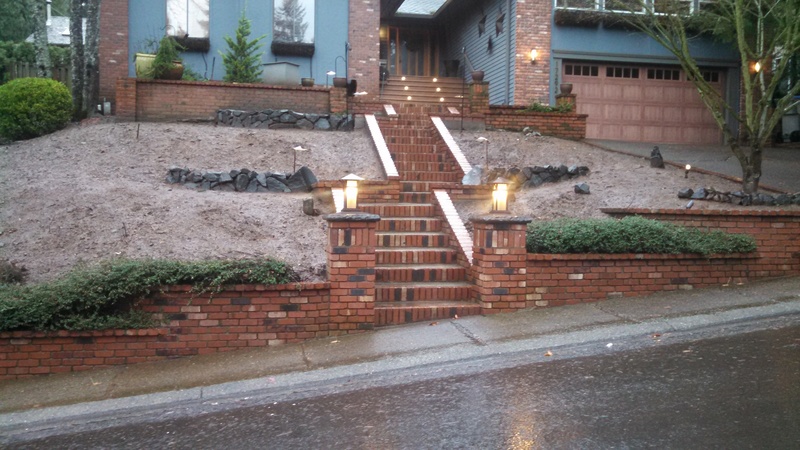 We removed the old concrete driveway and installed a rock base compacted then installed the permeable sand pavers from Willamette greystone in a herring bone pattern and ribbon on the boarders. 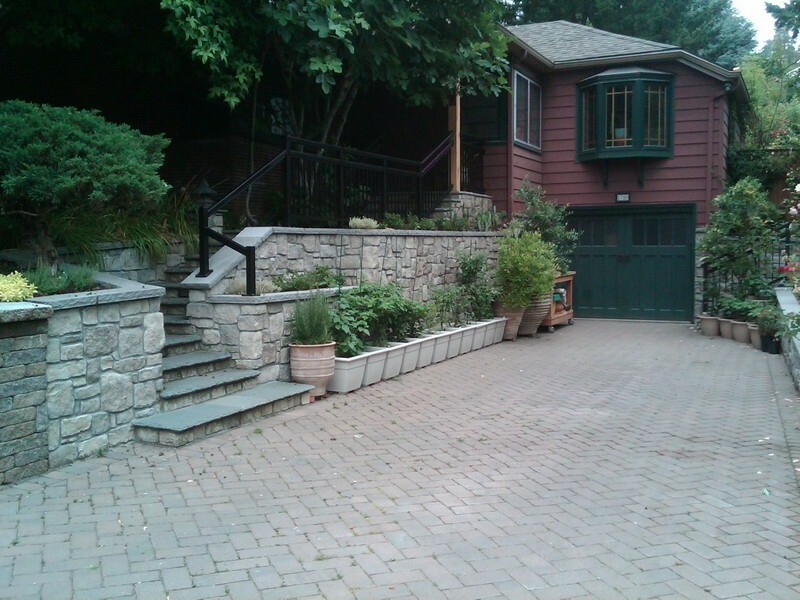 We then installed a new Celtic stone wall from mutual materials on each side of the driveway with cap stones. we also did the house next door and will be getting new pictures of it when all the plantings are done..It has a radius staircase in the back with saw tooth masonry in wall inside saddle walls on a radius with saddles steps through out the wall with brick paver walkways in herringbone pattern throughout the back yard and side with stone set pavers surrounding a pond. 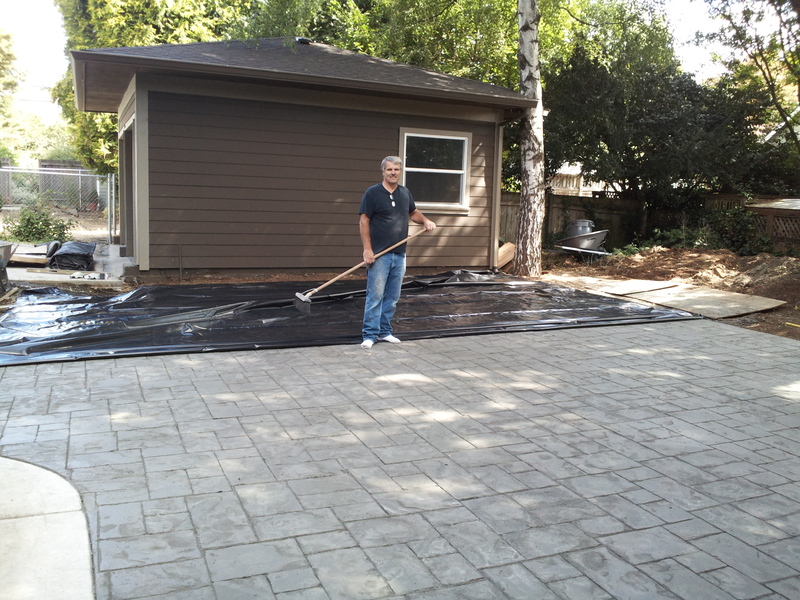 we also install a color concrete broom finish driveway with shadow colorings in the concrete. Here is a before and after driveway and staircase we did in eldorado stone with chisel edge blue stone steps,with darkened mortar in the blue stone ...we moved the entry staircase stairs forward and added a step at the base of the stairs . 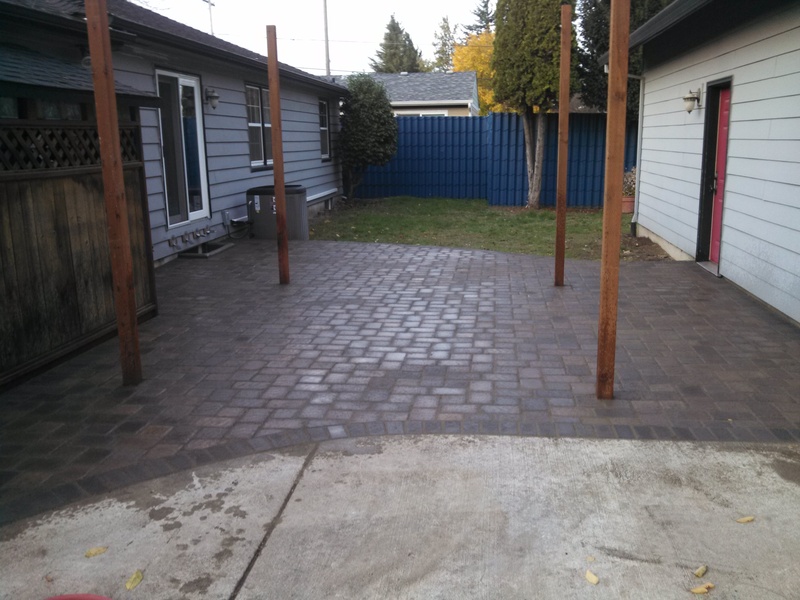 the driveway was done in aqua bric pavers from Willamette graystone. 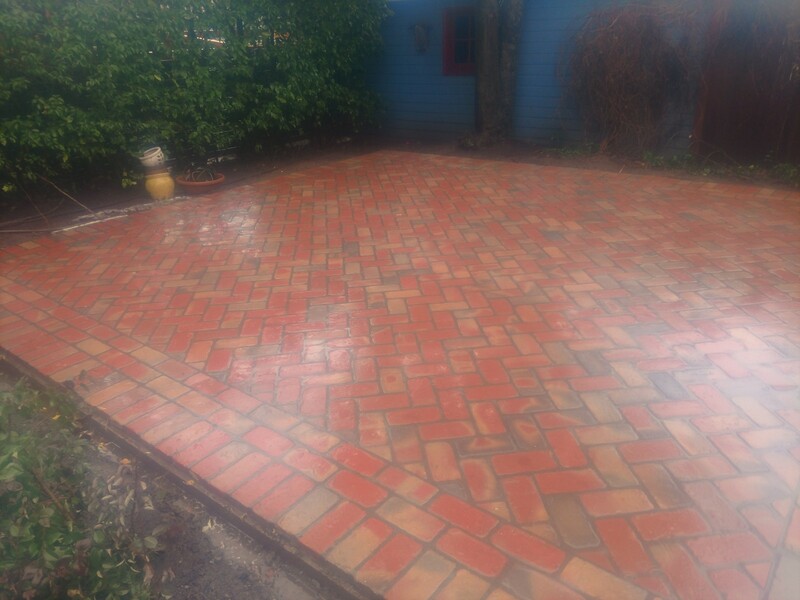 We took a old concrete patio and was able to utilize the base to save the customer money , we covered the patio in Old town red split pavers from Willamette graystone. 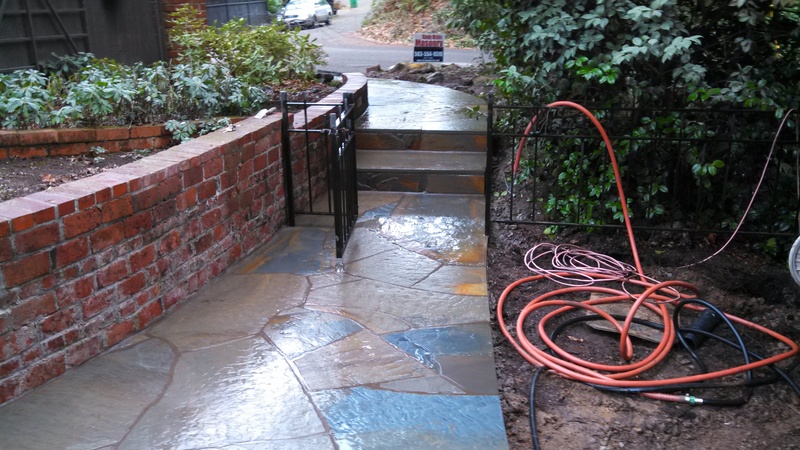 We installed the boulders and poured the base then install the variegated bluestone staircase and patio. 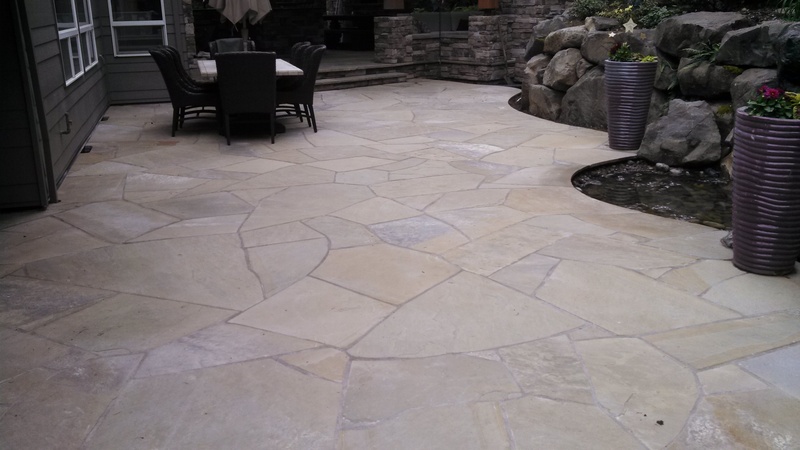 please look at our stone patios for more pictures of this beautiful patio. 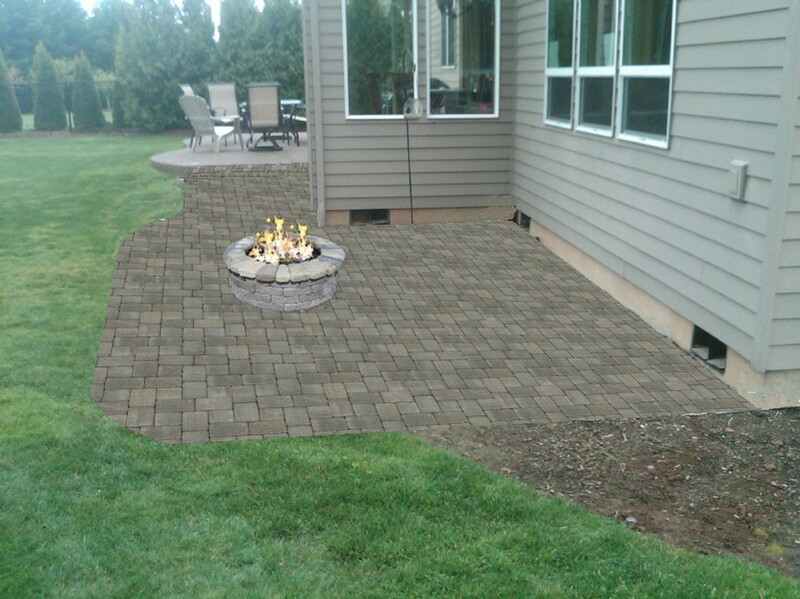 We started out with a picture of this area for the sandset paver patio .we then inserted the patio into the picture Before we did the patio...yes..we installed the picture of the patio before we did it. 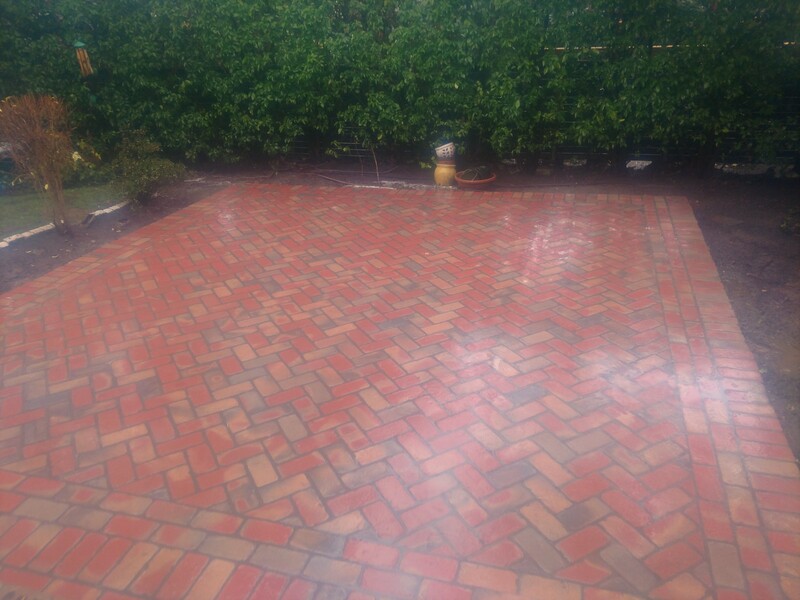 we are one of the few mason companies that can actually let you see what it will look like Before we do it.we can do this with brick stone OR interlocking pavers. 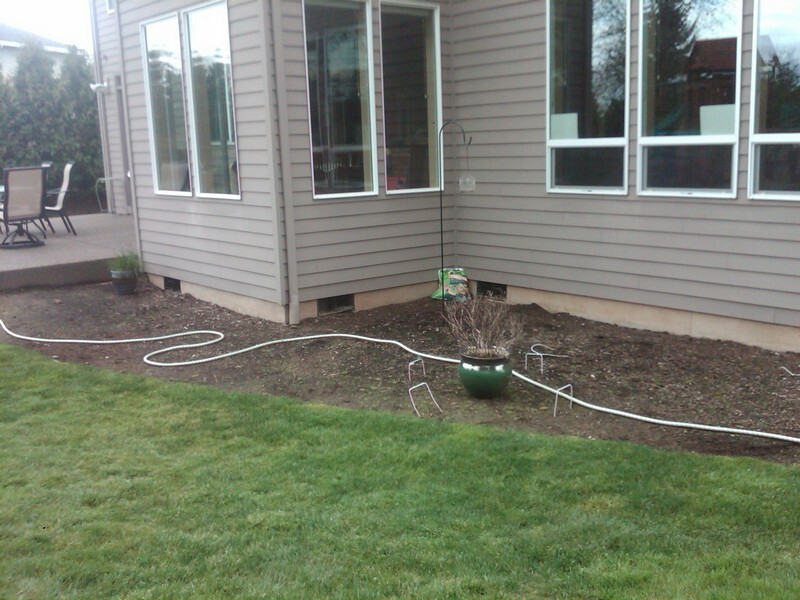 Here we started out installing a sand set paver patio, but the ground was clay and would absorb the water, the more rock we installed the more it sunk. So we installed a rat slab base and mortar set the patio, we use a special technique to keep the patio pavers at a acceptable level so when we lay the pavers they are all smooth to the surface. we then sanded the surface with a polymer sand that locks into the joints so you don't track sand into your home or have problems with sand blowing out of the joint work while cleaning. 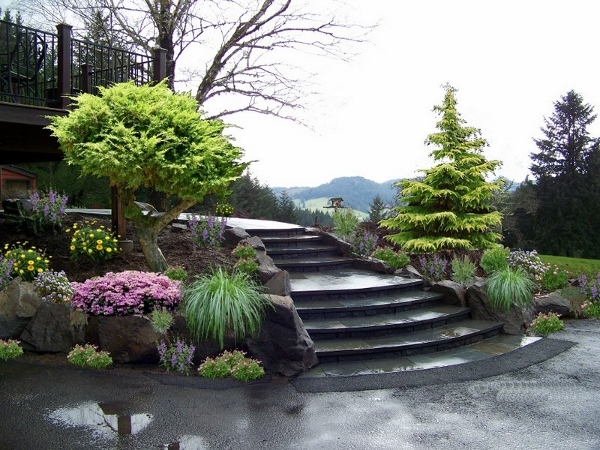 Call us today at 503-554-9510 or send us a web form for same day contact.